Creating quality content for your dental practice website is no easy task especially when your main focus is on patient care and running your practice. However, a strong website is equally important because it’s the way you communicate to prospective patients, bring in new leads for your practice, and maintain positive rapport with current patients. This portion of your business should not be an afterthought, but a priority. 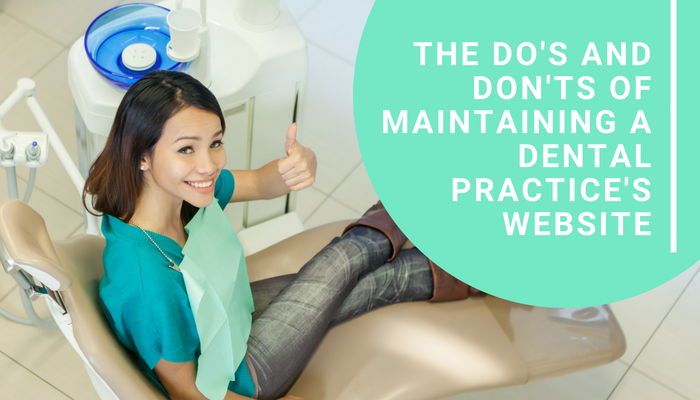 There are many ways to maintain a great dental practice website. In this article, we’ve identified the basic elements that must be addressed. The Americans with Disabilities Act seeks to ensure every business provides accessibility to Americans with disabilities in their places of businesses. But did you know this regulation also extends to websites? Yes, your website must also be ADA compliant. This means making sure all images include alternate text to properly identify what the image is. Pre-recorded audio must have captions. Also any forms must be fully accessible to screen reader users. Check out this handy accessibility checklist for more information on how to make sure your website properly complies with ADA standards. It’s very important for prospective patients to get an idea of who they will see when the come into your office. It helps to make a great impression, show off expertise, and establish a good rapport. That’s why including employee bios on your dental practice website is a good idea. Employee bios help to communicate that your office is friendly and personable. Having a separate page just for employee bios also gives you an opportunity to showcase your personality and overall personal of your practice. In the business of healthcare and customer service, reputation is everything. Posting positive reviews on your site is crucial to communicating the value of your service to prospective patients. Positive reviews provide social proof that your dental practice is reliable, knowledgeable, excellent with customer service, and reputable. It helps to include organic reviews from outside platforms such as Google or Yelp to lend even more credibility to your reputation. Pro Tip – Be sure to maintain an excellent response to all reviews especially the negative ones. You can minimize the impact of a negative review by responding kindly and offering to resolve the issue in some way. One of the most important elements of your website will be your contact information. Be sure to include your contact information on every page of your website. Additionally, it’s a good idea to include a page dedicated to getting in touch with you. On this contact page, you need to share your email address, phone number, and physical address. If there are any other contact points you have such as billing and prescription phone lines, etc. you should include these as well. Pay special attention to your physical address. It’s important to include a map of your location as well as parking information. It’s also a good idea to include a picture of the front of your business so new patients can find you more easily. People will always have questions. Questions about your hours, questions about emergency appointments, questions about your services and so on. One of the things you can do with a website is answer frequently asked questions. This helps visitors make important decisions without having to do any extra work and it also helps to cut down on unnecessary calls which will give you more time to run your practice. To find out what your most frequently asked questions are, make a list of questions you receive from phone calls and current patients. In order to rank high on search engines, your website must have consistently fresh content. The best way to do that is with a blog. Having a blog will help you keep in touch with current patients. Additionally a blog can further promote your brand and personality. Topic possibilities are endless. You can write about press you receive from the media, any awards or recognitions you receive, tips to maintain a healthy smile at home, new developments in dental health, how to avoid disease, your involvement in the community, day-to-day office routines, highlight an employee or a patient, and you can also curate things that relate to your practice on a local level. The key is to post relevant content consistently. If you’re not sure where to start with maintaining a blog for your practice contact us. We can help. Your dental practice website provides the perfect opportunity to communicate with current and prospective patients in meaningful ways. It is a bit of work to maintain a strong website, but with the right strategy in place and a little time, you can make your website work for you.